The Efficient SurgerY (ESY) – concept as an example of an integrated platform for patient safety, workflow efficiency and quality monitoring. Surgeons and surgical teams are more and more put under pressure towards improved workflow efficiency in order to decrease the expenditures of the surgical procedures. Hospitals and health care systems all over the globe are faced with increased costs due to the aging population. The increased incidence of osteoarthritis of the hip and knee joint, is the perfect example of the effect of the aging population on health care costs. Total hip arthroplasty (THA) is one of the most successful surgical procedures with reproducible outcomes. However, the costs associated with these procedures often vary from procedure to procedure and from hospital to hospital. Nevertheless, governments are pushing towards standardization of the reimbursement of these so called ‘low variable treatments’. The result is that hospitals are faced with tremendous challenges on how to standardize their cost structures when surgical procedures are being conducted. One of the most important risks of this evolution is that hospital administrators will decide topdown on which tools, which surgical techniques and which implants are available in the OR. In case economic arguments will become more important than ergonomic parameters or sustainable quality of care, we as surgeons will be forced to treat our patients in a less than optimal health care environment. Therefore, it is our duty to find solutions for these current health economic issues. It is clear that standardized surgical procedures such as THA can be made even more standardized and reproducible. Creative and innovative technologies can help us in this journey. In case surgeons proactively try to find answers to these economic issues, they will find their hospital administrators as their partner. A bottom-up approach from the surgical team is the only answer to protect quality of care at the highest level. All hospitals strive for improved quality of care however due to the contemporary and future cost issues, hospitals will have to find solutions that are not always to the best of interest for all stakeholders involved. 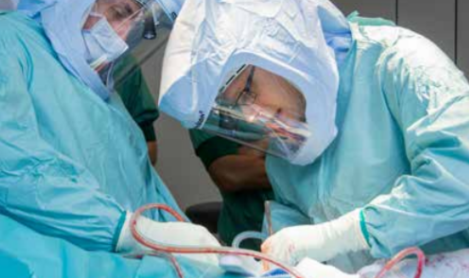 We introduced the Efficient SurgerY (ESY) – concept for all THA procedures in our hospital (Ziekenhuis Oost-Limburg, Genk, Belgium) to find bottom-up solutions for the increasing demands for cost-effective quality of care. With the support of our nursing staff, our anesthesiology team and our hospital administrators, we analyzed, rationalized and standardized every step of the OR flow. The Efficient Direct Anterior (EDA) hip was conceptualized within our Hip Unit as an innovative, cost effective and reproducible Direct Anterior THA procedure. We initially increased the expenditures of the procedure by utilizing new tools such as the EsySuit and the Gripper (MedEnvision). However, due to these tools and the rationalization of our instrument trays, the total OR time was decreased by an average of 20 minutes or 40% per procedure. The average cost per OR minute is estimated to be around 20-30€. The sterilization costs decreased by 60%. The savings are thus tremendous. Most importantly, this resulted in a significant reduction of the operative (soft tissue) trauma and improved visibility during the procedure which ultimately leads to improved outcomes and decreased complication rates (see below). Due to the involvement of the nursing staff and the improved ergonomics with the Gripper, the dynamics of the procedure have been improved leading to lower surgery times and more reproducible procedures. In summary, with the ESY-concept and the EDA Hip, we were able to decrease the direct costs, to reduce the surgical time and trauma, to improve the ergonomics for the surgical team and to increase the reproducibility of the procedure leading to a doubling of the surgical volume with the same staffing. The economics and ergonomics behind this ESY-concept became very clear. However, the most important question remained whether this improved cost-efficiency OR model ultimately lead to improved quality of care. In order to monitor this and to educate our patients, we integrated the Lynxcare software with our clinical and OR-flow. With this software, patients and procedures are automatically notified and monitored for outcomes and complications. This allowed us to collect data in a busy clinical practice. The data collected are constantly compared with the benchmark of similar procedures within this registry allowing us to continuously assess for flaws and improvements. The results of this integrated platform were overwhelming with clearly improved outcomes, lower hospital stay and lower complication risks compared to the benchmark. The strength of this way of monitoring is that the data collection does not interfere with a busy clinical practice and surgeons and hospitals have instant access to their outcome data and ‘internal’ implant registry. In comparison to the Belgian national joint replacement registry (Orthopride), this Lynxcare registry not only allows for comparing on implant survivorship but also provides information on ‘soft complications’ and patient satisfaction and functionality. Implant revision surgery -that is also captured in Orthopride- can be considered as a ‘hard complication’ and is obviously an important outcome parameter. However, understanding that 90% of patients have an excellent and ‘all’ complication free rehabilitation is even more important and informative towards our patients. Especially because it allowed us to understand that still 9% had some muscle soreness, low back pain etc during the rehab process. In total 0,8% of patients had an intervention during or after the index procedure. The short coming of the Lynxcare registry today is that the registry needs to expand further in order to create more representative data from the benchmark. This is only a matter of time. In conclusion, the integration of the Lynxcare technology with the ESY-concept technology (Gripper and EsySuit, Medenvision) resulted in automated monitoring of the outcomes, complications and implant survivorship of more than 1.000 patients operated today with the EDA hip. This bottom-up approach towards OR efficiency allowed me, my team and my hospital to create a cost effective OR environment along with an improved quality of care. In the challenge to deal with increased cost cutting, we surgeons should pro-actively seek for innovative technologies and solutions to protect our quality of care! Initially, it seems a struggle to convince all involved stakeholders, including our hospital administrators because introducing new technologies is always associated with new costs. However, we learned that explaining the big picture of the concept and involving the whole team from start, actually resulted in a dynamic process that is supported by all stakeholders and currently still is evolving and improving. Regardless of the surgical technique or procedure, I strongly believe that a proactive and integrated approach of cost efficiency such as the ESY-concept, will ultimately lead to sustainability of health care and reproducible joint replacement surgery in particular. Hopefully, in time, more health care providers and governments will understand that in order to maintain quality of care for our patients they should not blindly introduce cost cuttings but should rather invest in technologies and concepts that allow creating more cost-effective procedures and treatments with improved quality of care. Investing in technologies that decrease the risk of complications is much less expensive than dealing with the costs associated with these complications. In order to support surgeons and teams interested in cost-effective OR flows, we initiated the educational website www.esy-concept.com.